LOOKING FOR GREAT SUMMER CAMPS IN DANE COUNTY THIS SUMMER? If you’re searching for summer camps in and around Sun Prairie or Madison, WI you’ve come to the right place! Here you will find many camps for every type of camper. Imagine this, it’s early June, the kids have only been out of school for a week or two but they are running around the house like animals. Help them spend that extra energy at any number of Prairie Athletic Club’s camps listed below. There’s no better place for your kids to stay ACTIVE and have FUN this summer! Our summer camps are state-licensed and have many different themes throughout the week. Spend the mornings exploring new activities and enjoy water park fun in the afternoon! They’ll have a great time getting or staying healthy while you’ll get a little rest and relaxation. 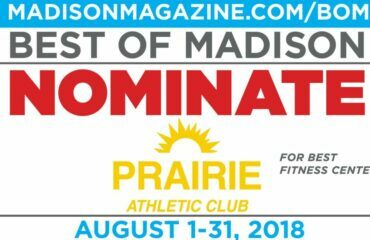 Prairie Athletic Club offers a variety of activities for kids of many ages interested in fundamentals, skill development, practice, and just plain fun! This summer’s sports/fitness offerings include soccer, basketball, football, POM, and new for 2018 Flex – Fit – Fun for ages 10-13. Prairie Athletic Club’s amazing staff and coaches are responsible for the care of each student. We design our summer camps to reach each age group at varying levels of skill. All camps are open to the general public. You do not need to be a Prairie Athletic Club Member. Campers will spend their first week meeting our counselors, lifeguards and of course other campers. Focus will be on team building skills and finding their way around PAC and Dolphins Cove. Ages 5 – 12. Campers will learn fishing safety and skills as well as rules and regulations. Each camper receives a fishing pole, too! Ages 5 – 7. Just for Fun Camp will be held every Monday and Friday! Ages 5 – 12. Let’s get ACTIVE! Come learn about nutrition, make some healthy snacks and participate in fitness classes! Ages 5 – 12. NEW FOR 2018 – Is your child too old for child care but you don’t want them to be home alone this summer? Coach Mike and staff will lead this new camp designed for the child who enjoys fitness, sports and waterpark FUN! Ages 10 – 13. Celebrate our country. Take a tour of America, make a flag and experience all our of our states! Ages 5 – 12. Campers will participate in a variety of drills and scrimmage games to work on their skills in basketball. Ages 5 – 12. Campers will work as a team, build acting skills, increase imagination, gain confidence and perform. Ages 5 – 12. Come learn about nutrition, make some healthy snacks and participate in fitness classes! Ages 5 – 12. Campers will learn all about safety and have visits from local Police, Fire and EMS. Water safety will be included as well. Ages 5 – 12. Perfect your skills and have fun! Get ready for the fall season and PAC classes and leagues. This camp will be held outdoors at PAC field. Ages 5 -12. Come learn about science through experiments and hands-on fun. Ages 5 – 12. Does your child love animals? Campers will learn all about animals who live on land, in the air and in the water. Ages 5 – 12. PAC staff leads this camp of nothing but fun! Activities have included old time summer play (marbles, hopscotch, kickball), scavenger hunts and more! Ages 5 – 12. Football players will learn learn and practice drills that they will be able to use on the field. This camp will be held outdoors at PAC field. Ages 5 – 12. Three days of learning cheers, skills, and routines from PAC dance instructors and local Pom dancers are included. Participants will have the opportunity to walk in the Sun Prairie Corn Fest parade. Ages 5 – 12. Campers will learn fishing safety and skills as well as rules and regulations. Each camper receives a fishing pole, too! Ages 8 – 12. PAC staff leads this camp of nothing but fun! Activities have included old time summer play (marbles, hopscotch, kickball), scavenger hunts, and more! Ages 5 – 12. Relays, parachute, picnic lunches. Enjoy this week of summer camp outside playing games. Ages 5 – 12.